“There’s a lot of history with the Bushes here at the hotel. George Bush Sr. lived here for a while at the Manor House and was moved to the hotel. They would come here quite often. They know all the employees and servers names at Olivette. They considered this part of their home and family, and we consider them part of our family,” said Pastry Chef Catherine Rodriguez. 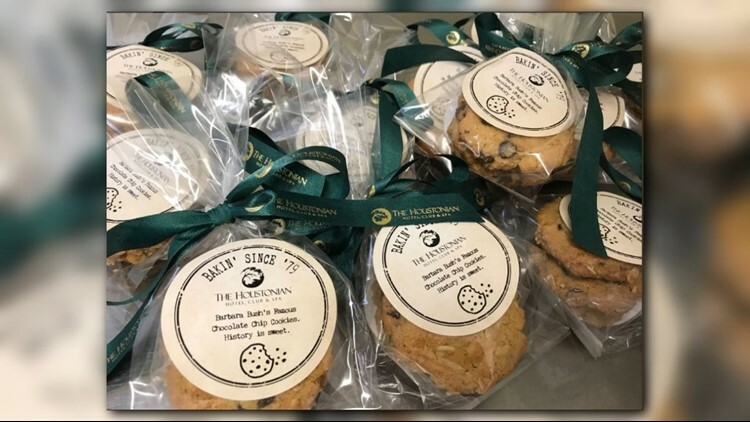 Barbara Bush's chocolate chip cookies packaged by The Houstonian Hotel. Now, they’re sharing the recipe to honor the former First Lady. Blend butter, granulated sugar and brown sugar. Sift and add the flour. Add and mix in the oatmeal, vanilla and chocolate chips. Drop by teaspoonfuls onto cookie sheet. *Pro tip: Make sure butter and eggs are room temperature before mixing.